2013 hopefully will include healthy eating. A good start is getting serious with my Weight Watcher membership. Preheat oven to 375ºF. Press pie crust into bottom and up sides of a 9-inch, removable-bottom tart pan or a 9-inch pie pan; refrigerate until ready to use. To make filling, heat oil in a small skillet over medium heat. Add onion and sauté until soft, about 3 minutes. Transfer onion to a large bowl and add ricotta cheese, cheddar cheese, egg, egg whites, mustard, oregano, salt and pepper; mix well and fold in broccoli. 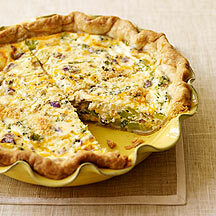 Spoon mixture into prepared crust and level surface with a wooden spoon; sprinkle with Parmesan cheese. Bake until a knife inserted near center comes out clean, about 35 to 40 minutes. Let stand 10 minutes before slicing into 8 pieces. Yields 1 piece per serving. Not a broccoli fan? Substitute spinach in its place.